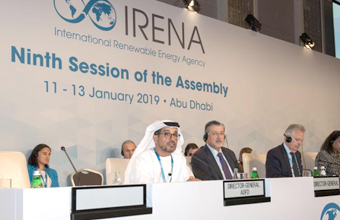 Abu Dhabi Fund for Development (ADFD) and the International Renewable Energy Agency (IRENA) today announced the selection of renewable energy projects in Guyana, Liberia and Togo for funding by ADFD, as part of the sixth cycle of the IRENA/ADFD Project Facility. With ADFD committing US$350 million over seven funding cycles to the IRENA/ADFD Project Facility since 2013, today’s announcement, during the Ninth Session of the IRENA Assembly, brings cumulative funding to date to US$245 million. The Facility helps developing countries access low-cost capital for renewable energy projects to increase energy access, improve livelihoods and advance sustainable development. In Guyana, a project will receive a loan of US$8 million to install 5.2 megawatt (MW) grid-connected solar PV systems in the hinterland regions to reduce fossil fuel consumption and increase the reliability of electricity supply. An estimated 34,700 people in the target areas will benefit and around 120 direct and indirect jobs are set to be created throughout the project lifecycle. In Liberia, the loan of US$8 million will contribute to the construction of a 2.1 MW run-of-river hydropower plant on the Gee River. The project will benefit over 30,000 people through providing a clean, reliable and affordable source of energy to households, schools, health facilities and small businesses, enhancing living conditions and helping to reduce poverty. In Togo, a 30 MW grid-connected solar PV plant will be constructed with the investment of a US$15 million loan. The project aims to bring clean, reliable power to around 700,000 households and small businesses and reduce greenhouse gas emissions by 9,242 tonnes/year. Local communities will benefit from greater access to drinking water, education and healthcare as well as job creation that prioritises women. Since the first cycle selection of projects in 2014, ADFD funding has been allocated to 24 renewable energy projects across the world, covering up to 50 per cent of the total project costs. They will bring more than 157 megawatts of renewable energy capacity online and create electricity access for over seven million people, significantly improving their livelihoods. Spanning Asia, Africa, Latin America and Small Island Developing States, the projects encompass a broad spectrum of renewable energy sources – wind, solar, hydro, geothermal and biomass – and technologies. Funding is available for sustainable development projects that are backed by a government guarantee. The seventh cycle is open for summary applications until 17:00 GST on 14 February, 2019.